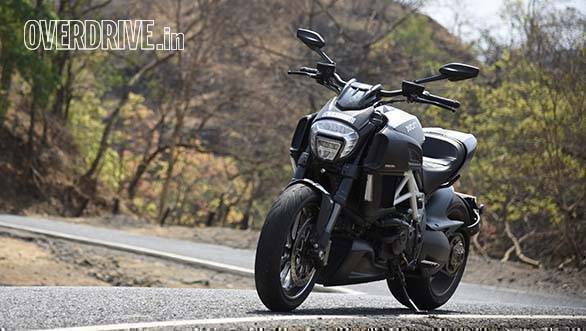 The Ducati Diavel is a difficult bike to explain, it literally exists in a class of one. Perhaps the best way to rationalise the madness is to call it what it is - Ducati's idea of what a cruiser should be. "You want a cruiser? Okay, is no problem, here's a long wheelbase and a nice soft seat. The rest, she is pure Ducati!" Pure and how. The Diavel shatters every preconceived notion about what a cruiser can and should be capable of. Ducati may not call it a cruiser, but that's the market they were targeting so that's the market we will refer to. 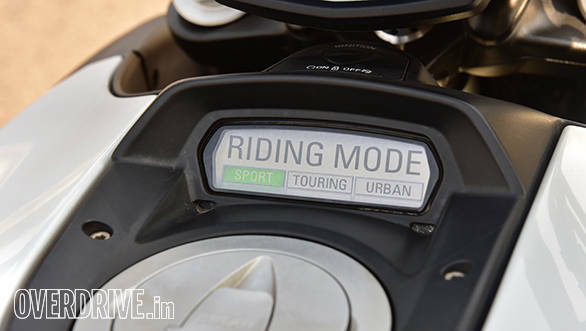 The name Diavel came up during development around 2010. Legend has it that an employee saw the prototype and cried out, "Ignurànt comm' al diavel!" or "evil, like the devil!" The name stuck and the Diavel has been striking awe and terror in the hearts of spectators (and riders!) ever since. This is the second generation model that was released in 2015. It cuts the same wicked shape but wears a brilliant new LED headlamp, a slightly different seat shape and those wild slashcut exhausts that follow the form of the ginormous rear wheel. The bike here is the Diavel Carbon that demands Rs 3 lakh more for its carbon fibre front fender, fuel tank and removable rear cowl. Most of all, it brings those lovely Marchesini forged wheels that shave off 5kg of unsprung mass. The rear cowl is removable via an allen key to reveal a pillion seat. There's a cool keyless ignition system that detects the fairly large key in your pocket and allows you to unlock and start the bike via a sliding kill switch. Be careful not to lose the key though, replacements cost Rs 9,000. Like the old bike, the Diavel is equally stunning and menacing, one of the biggest attention magnets I've ridden. The view from the saddle is pretty special with the split meters residing on the smooth and ever so long tank that creates the impression of being at the helm of a luxury speedboat with a handlebar. But the devil is also in the details. I love how there are no extrusions with two neatly integrated led strips acting as the front indicators while the dual led strips in the short and butch rear end double up as the indicators and brake lights. 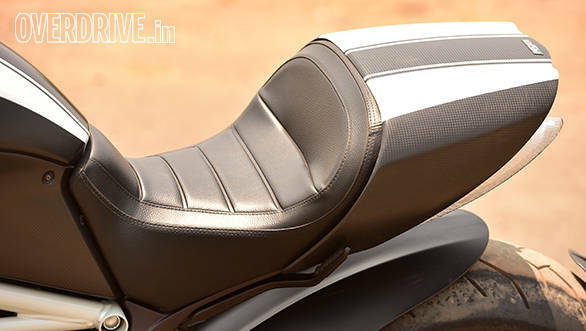 Even the pillion footrests smartly fold out of sight into the bodywork. Lovely! A couple of things do bug me though, like the rough finish at the base of the exhaust and the fact that the white on the frame is a slightly different shade from the white on the tank. As with most cruisers, the Diavel uses a V-twin engine, except this one is based off a superbike motor and makes 162PS at 9,250rpm and 130Nm at 8,000rpm. One look at those rpm figures and you know this is not your standard, all-about-the-torque twin. As you might expect, it also behaves very differently from the typical inline three or four cylinder screamer. 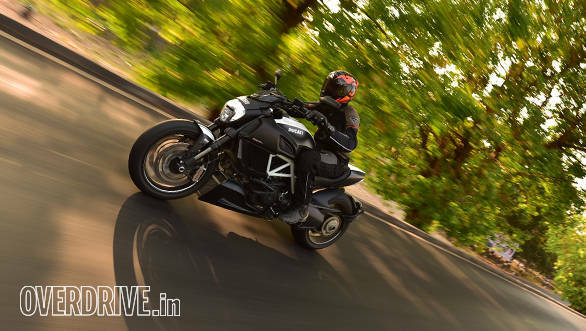 Where those bikes fire up instantly, the Diavel slowly cranks and chugs its way to life, taking a couple of seconds of keeping the starter button held. But once it's on there's zero laziness. A tiny blip of the throttle and the revs rise sharply, producing a startlingly loud bark from the exhaust. From the get go, there's a constant chain slap noise on gear changes or closing the throttle. With a chain that long and a swingarm so massive this is apparently a way of life with the Diavel but Ducati assures us that neither the swingarm nor chain are affected by it. Chain clatter aside, this is a seriously loud bike and even on stock pipes it produces a fearsome and angry roar. It's far from musical and instead forewarns of massive power and aggression. 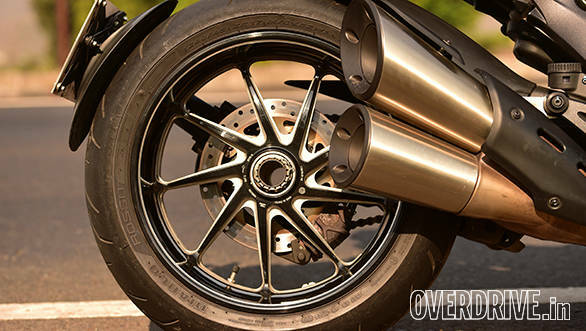 The Diavel abhors low revs. It's not so much a problem with the bike as a flaw in the engine format. Big V-twins, especially such tremendously powerful units are generally cranky at low revs, this one particularly so. Anything below 2,000rpm is lumpy and grumpy and if you drop below 1,500rpm there's the distinct possibility of a stall. Couple this with a heavy clutch and searing heat coming off the rear cylinder onto the right thigh and you have a motorcycle that isn't very friendly in congested city traffic. Upwards of 2,000rpm though is a whole different game. Cracking the throttle open produces a surge is so explosive that before you know it you're banging off the 10,000 rpm limiter in first gear at 99kmph. It's in situations like this where you wish the 6-speed gearbox was a little smoother. It occasionally mis-shifts if you aren't firm enough with the lever and finding neutral at traffic lights can also be a pain. That is but a minor inconvenience as the Diavel is one of the fastest accelerating motorcycles I've ever ridden, and I've ridden a few this issue. First gear acceleration is so shocking, that Ashok, our designated tester says the three-second 0-100kmph run was the most violent launch he's ever experienced. 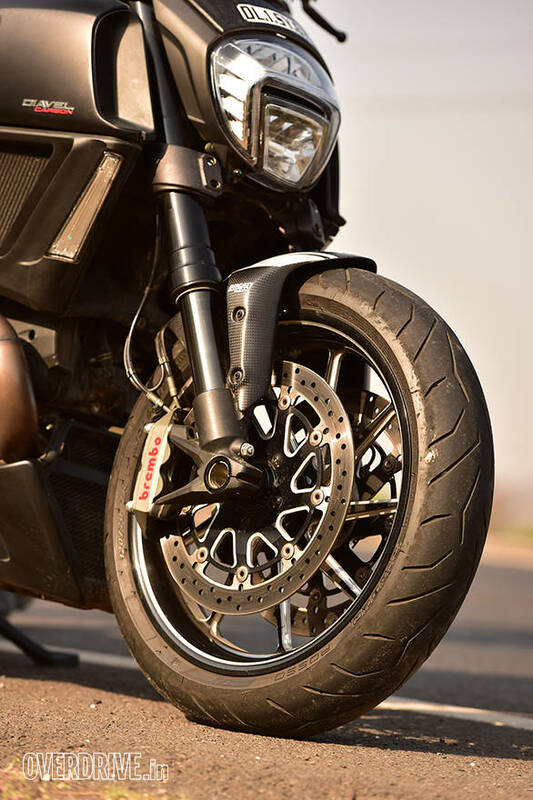 There's only so much grip the vast 240 section rear Pirelli Diablo Rosso II can offer and the traction control works overtime restraining slip and holding back the wheelies. 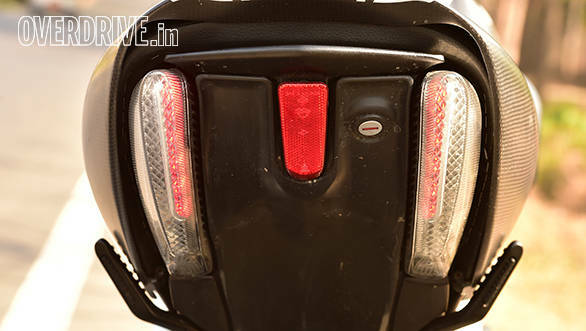 It's quite a brutal system too, lacking the finesse of the Aprilia Tuono's package. Even after the motorcycle settles, the power is relentless and before you know it, 200kmph has flown by in 4th gear. Ultimately, the complete lack of wind protection is what will make you back off. If this is all a bit much, there's always the choice of backing it off by choosing City riding mode that cuts power to 100PS, dulls throttle response and heightens traction control. The other two modes are Touring that offers full 162PS with lower throttle response and a mid level traction control setting. Sport provides full power, full response and minimal traction control intrusion. City is good for bumper to bumper traffic but I found Sport can work in most situations and is naturally, the most exciting mode of the lot. Huge performance in a cruiser is not a new thing, the Triumph Rocket III and Yamaha Vmax will argue. 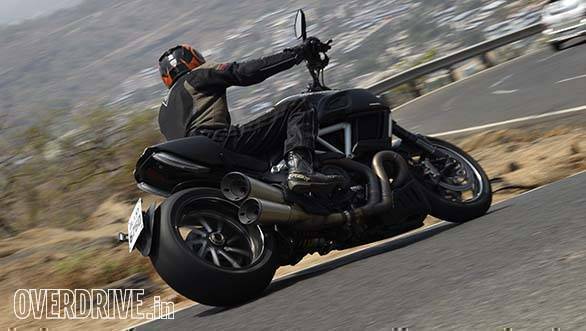 And that's where the Diavel breaches into unchartered territory - its physics defying handling. Let's start with the riding position. The feet aren't extended forward and are instead positioned more like a street naked. The arms, however, stretch to the wide and flat bar and this puts you in an unusual and aggressive forward leaning stance. That lovely deeply recessed seat is quite comfy at a low 770mm and I love how it supports under hard acceleration. It's a riding position that works for both short and tall riders. Ride quality is firm, but not crashy like your typical old-school cruiser. Instead it conveys a heavily damped sensation similar to a focussed sportbike. A sign of things to come. Before that, we must consider the weight, or lack of it. The Diavel weighs 234kg, which is just five kilos more than a Kawasaki Z800 and nearly 80kg less than either the aforementioned Triumph or Yam. Still, at low speeds, the Diavel is not light footed. U-turns need a strong push at the bar which has a tendency to fold in towards the rider, probably due to that massive rear tyre and the unusual mix of a long wheelbase and a relatively sharply raked front end. The same applies for higher speed corners with considerable countersteer needed to turn-in and a constant pressure on the bar required to stay leaned over. Handling is amazing for a cruiser, the DIavel offers 41 degrees of lean! 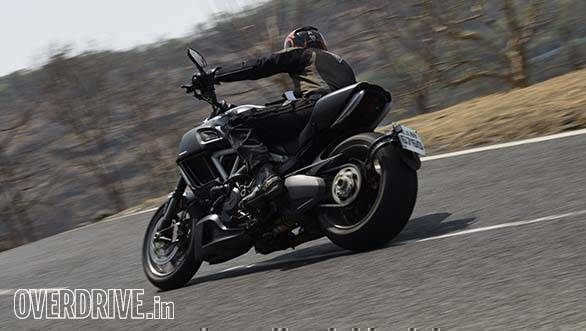 It soon dawns that the Diavel has to be grabbed by the neck and flogged to properly experience its abilities. 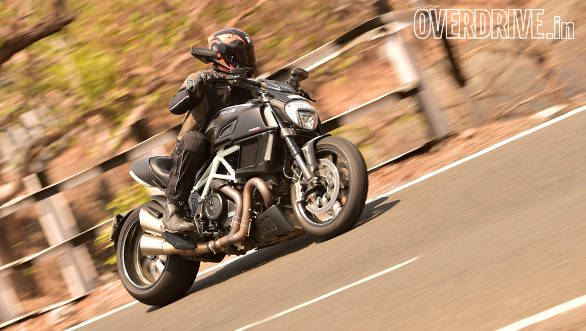 Ridden hard down a fast, winding road like the old Mumbai-Pune highway, the Diavel doesn't feel like a cruiser at all. Instead, it's easy to be fooled into thinking this was a Monster with a longer wheelbase. Oh and about fifty more horsepower. It takes a firm hand on the bars and at no point can you afford to hesitate, literally having to show the bike who's boss. It's like a ferocious Rottweiler that responds to only one person and will tear you apart at the slightest hint of weakness or fear. Confidence to do this comes from the spectacular four pot Brembo monoblocs and dual front discs. Among the best brakes I've encountered, they allow incredibly short stopping distances with minimal ABS intervention. And of course there's the comforting knowledge that the traction control system has your back. 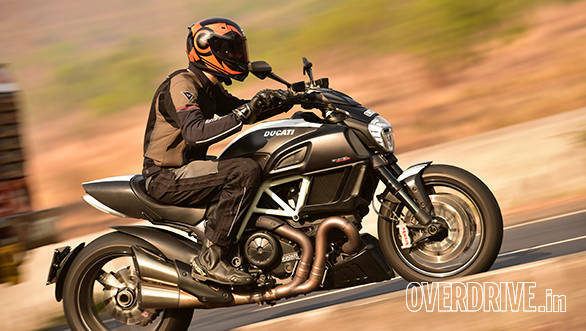 The Diavel is not for everyone, and it most certainly is not a beginner motorcycle. The comprehensive safety net will keep your skin intact but to properly exploit the Diavel's capabilities takes both experience and effort. As special as the Diavel is, it only all comes together in the right environment. This makes it a great a Sunday bike but too painful for everyday riding. It's the perfect machine for someone who's spent years on sportsbikes and wants the same violence but more comfort. I can imagine it's a good excuse for the family too. "Okay everyone, I'm done with the fast and dangerous sportsbikes, time to graduate to a nice cruiser." Yeah, right. 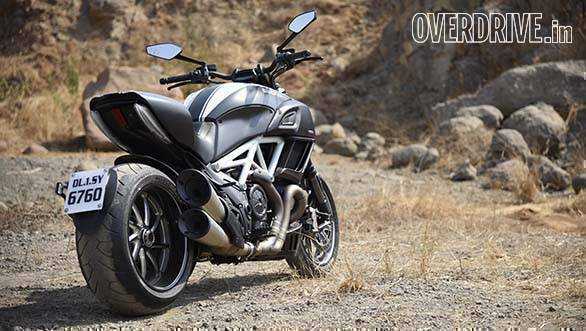 Rs 20.89 lakh on-road Mumbai is what the Diavel Carbon will set you back. A serious sum of money that gives you not only a raging supermodel of a motorcycle, but also the happy knowledge that there's absolutely nothing else like it.